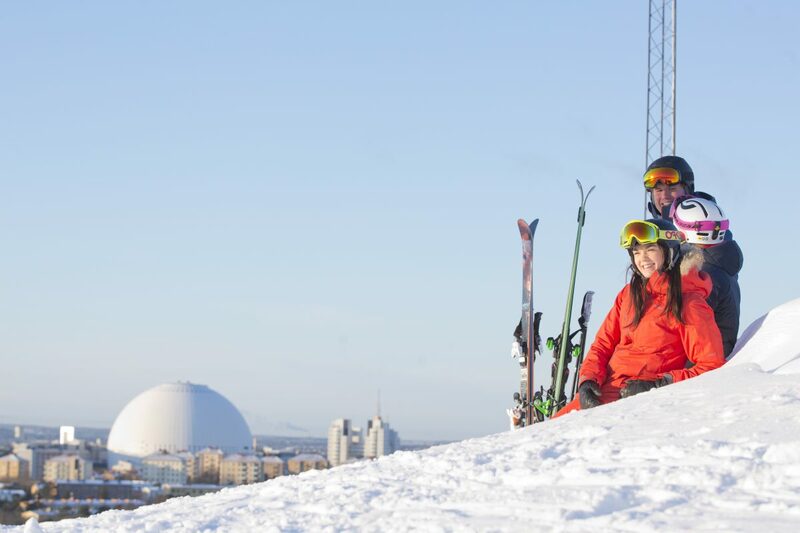 Did you know that during your winter trip to Stockholm you may enjoy some skiing in the city center? Well, now you know. Hammarbybacken is the place and it is located on the opposite shore of the southern part of Södermalm Island in the south of Stockholm. So you are still able to pack your skis, snowboard and other gear and enjoying riding some slopes downhill surrounded by amazing views. This year 2018 has been an incredible snow-rich year as everyone who has traveled to Sweden during the winter has experienced or everyone going to visit Stockholm at Eater will experience. During this winter season not only the Swedish mountais all across the country are packed with snow with depths well over the mean but Stockholm also is. It is a record-breaking season! And weather forecasts talk about sunny days and good weather on the horizon which will motivate many more skiers both Swedish an tourists to go skiing. At Hammarbybacken there is also a snowpark, a ski school and equipment rental. There’s even Stockholm’s first ski hotel – the Park Inn Hammarby Sjöstad by Radisson – located right at the footsteps of the slopes. You can make it to Hammarbybacken by metro to Skanstull and then getting on the bus 74 and getting off at Sickla kaj stop. From there you have to walk 5-10 minutes through Hammarby Allé avenue. Another possibility is to take the metro to Gullmarsplan and change to tvärbanan (a light railway) to Sickla kaj. If you are coming to Stockholm off season you will not be able to ski in the city center but there is always a chance to do it at about 600 km away in Åre ski station (via Östersund airport) which opens until May 1 allowing for spring skiing with its sunnier and longer days.